Dive into an ocean of one-of-a-kind experiences at SeaWorld® Orlando! From unforgettable wildlife shows and encounters — including dolphins, manatees, penguins, sharks and more — to hair-raising thrills on some of Orlando’s best roller coasters, you’re always in for a day of adventure at SeaWorld. Animals take center stage here — especially when it comes to SeaWorld’s famous, family-friendly live shows. From the titular stars of Dolphin Days and majestic killer whales of One Ocean and Ocean Discovery, to the hilarious antics of Clyde and Seamore’s Sea Lion High and the cast of dogs, cats, ducks and even pigs of Pets Ahoy, these performers will leave you thoroughly amazed and entertained. You can also get close to SeaWorld’s stars via animal encounters throughout the park. Watch the playful denizens of Dolphin Cove, explore the habitat of everyone’s favorite tuxedoed birds at Antarctica: Empire of the Penguin, and spend time with beluga whales and walruses at Wild Arctic. Plus, the latter two attractions feature fun rides in addition to self-guided tours! Still more opportunities to see nature’s wonders await at SeaWorld, including the heartwarming Dolphin Nursery and Manatee Rehabilitation Area. Want more? You can also book a behind-the-scenes tour or up-close dining package. Don’t lose sight of SeaWorld’s pulse-pounding rides while you’re communing with nature, though. Otherwise, you might miss out on the virtual reality-enhanced Kraken Unleashed roller coaster, where you’ll blast through a deep-sea journey featuring the eponymous monster and a menagerie of other legendary beasts. Other white-knuckle attractions at SeaWorld include the Mako “hyper coaster,” the Manta and the all-new Infinity Falls, which will send you careening through the remains of a lost jungle civilization. Chances are you’ll get a bit wet on all three, and you definitely won’t be dry after experiencing Journey to Atlantis! Visiting with smaller children, or prefer your rides to be more mild than wild? SeaWorld has you covered there, too, starting with the all-new Sesame Street. Packed with themed rides, shopping, dining, character encounters and interactive play, this 6-acre land also features SeaWorld’s first-ever parade. Gentle fun can also be found in the retro-cool Flamingo Paddleboats and 400-foot Sky Tower, which dates back to the park’s opening in 1973 and provides amazing views of the surrounding landscape. 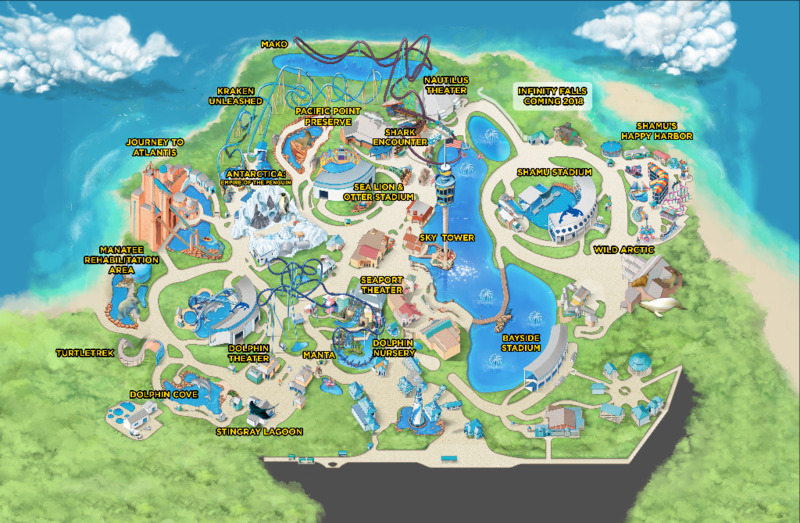 Ready to experience SeaWorld for yourself? With discounted tickets from Visit Orlando, you can visit SeaWorld for one day or choose your adventure with two-day, three-day or unlimited visits with free parking to access all four of SeaWorld’s Florida theme parks. Add the All-Day Dining Deal and enjoy all-you-can-eat dining, all day, for one low price at participating restaurants. It’s time to splash into fun! Take Exit #1 to International Drive. At traffic light, turn left. At the second light, turn right onto Central Florida Parkway. The entrance to SeaWorld is on the right hand side of Central Florida Parkway. Make a left onto International Drive. Make a right onto Central Florida Parkway at the second traffic light. Take I-4 East (toward Orlando) to exit 71. The main entrance to SeaWorld is on the left hand side of Central Florida Parkway.